CHANGE IN ACCESS POINT TO RIFLE RANGE – EFFECTIVE AUGUST 1, 2018. Please read the complete message from the Board of Directors. The range road may be shut down for a period of time to clear the road after significant snow falls. There will be a sign at the bottom of the road noting the ROAD IS CLOSED. Please don’t travel around the sign. The Caretaker will be using heavy equipment to plow the road. 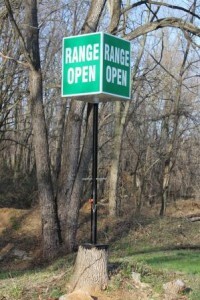 The Caretaker will remove the road closure sign when it is safe to travel to the range. Information on metal targets: The rifle range now has steel targets. Please remember “no full metal jacketed ammo” can be used on the mental targets. Gongs are normally painted black or white. Members will need to have their own paint if they want a freshly painted surface. Signage at the rifle range already specifies frangible, expanding ammo on steel. We offer a handgun range with covered shooting stations and target backstops at 10 and 25 yards. We also offer a rifle range with covered shooting stations and target backstops at 50, 100, 200 and 300 yards. The pistol and rifle ranges are reserved for MEMBERS ONLY. Please display your membership badge when using these facilities. Please keep the gate locked at all times, including after entry to the facility. Please consult the rifle and pistol range rules on this website for a full list of the rules applicable to the use of the facility. We have added a new sign to range (see below) to assist everyone in knowing when people are down range, whether they can be seen easily or not. The sign pivots easily and locks into place by use of a pin. Use of this sign is now mandatory on the range for all range users and when maintenance work being done down range. 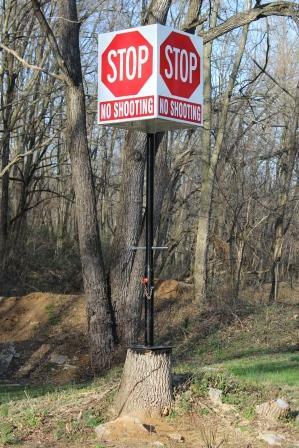 This sign serves as an extra measure of safety for all range users. Please rotate the sign when going down range and when the range is going hot.